Signage around the booth for Project Jacquard at Google I/O 2015, the company's smart fabric effort. Wander around the halls of Google's I/O conference and eventually you'll bump into a large table covered with a blue cloth. But being I/O, this is no ordinary cloth. It's a smart fabric developed by Google's advanced technology group that could one day control your smartphone or the lights in your home. Called Project Jaquard, it's an experiment that involves weaving electronics into fabric to create the equivalent of a touch screen inside the material. The surface feels like a patch of corduroy, but stroking your fingers up and down or sideways controls nearby electronics. Google had set up a few demo stations on the table where people could interact with the cloth. One patch allowed you to manipulate a 3D image on a nearby display, while another changed the song on a phone, and yet another controlled the lights overhead. It's not clear what Google plans to do with the technology, which was developed by its Advanced Technology and Projects group, the division responsible for Project Tango, Google's 3D mapping technology. But we'll find out more at a session on wearables at I/O on Friday morning. Google says it will show new technology there that will "blow your socks off," so presumably the fabric is destined for wearables you can wear on your body. A https://www.google.com/atap/project-jacquard/">website for Project Jaquard says virtually noting, but there's some video of an industrial sewing machine weaving fabric, so its possible Google has come up with a way to mass produce cloth with electronics woven inside it. 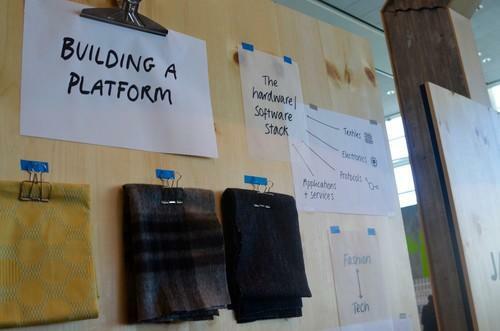 The fabric is currently being woven at mills in the U.S. and Japan, according to a sign near the table at I/O. Carsten Schwesig, who works on the project and was giving demos, said the technology can be incorporated into virtually any woven fabric. A wall behind the table had pieces of wool and silk hanging from it, suggesting where the technology might end up. Google and its partners have been working on the technology for roughly a year, Schwesig said. Google says it's built around the idea of "connecting without screens."